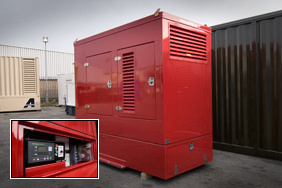 A gas generator is installed in a 65dB(A) @ 1mtr Flared Acoustic Container for a UK energy provider. 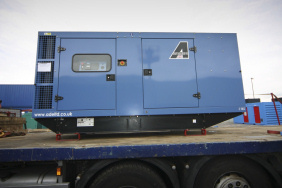 The generator was free issued to ADE by the customer. It is shown here assembled in the factory and (inset) dismantled and ready for loading in the yard. 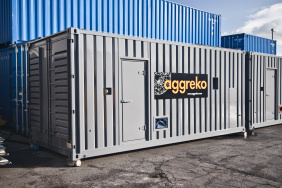 Aggreko chooses ADE once again to refurbish damaged and worn fleet items, from small on site fuel tanks to megawatt containers. Air inlet / outlet attenuators and part of the super silenced exhaust system are shown here for a 4MW indoor power plant in Leeds. 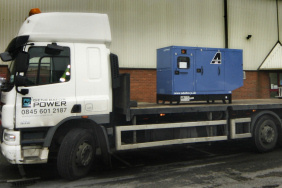 Four generators loaded for delivery to a UK power provider. A 66kVA John Deere generator loaded for delivery to a UK based generator company. Two pump sets and three remote radiators are prepared for shipping to Africa. 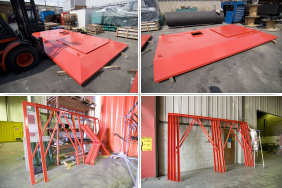 To speed up production of our large British Standard rated diesel fuel tanks, we have just taken delivery of a 10 tonne crane for inside the ADE factory. The crane will mainly be used to lift the heavy steel sheets which are used when making the large fuel tanks. Two 1400kVA, 11000V gensets , installed in acoustic enclosures are now on their way out of the country to join the other six built last year. Also shipped with this order were two 27,000 litre fuel tanks and a 20' shipping container with all ancillary parts (exhausts etc.) for the two generator systems. 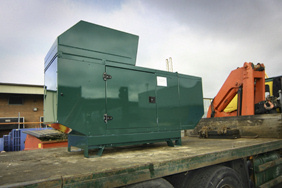 A standard silenced enclosure is sent to a UK logging company. This 'off-the-shelf' unit was despatched with a first fill of fuel and all relevant technical manuals. An extended fuel tank was added to this 200kVA John Deere generator, allowing for an extra 16 hours of autonomy. 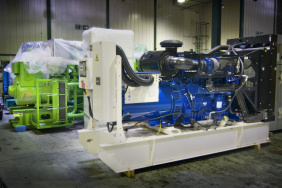 The generator is now providing power for a hospital in Hertfordshire. This enclosure was custom designed and manufactured for a Switchgear provider. 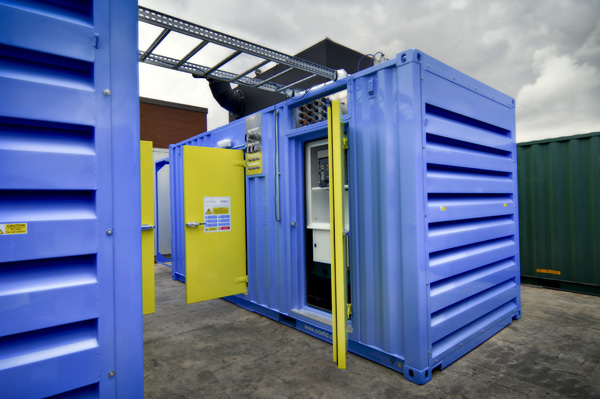 Along with mountings for the switchgear (installed by the customer on site) fire detection, intruder alarm and a marshalling box were also built into the enclosure by ADE. 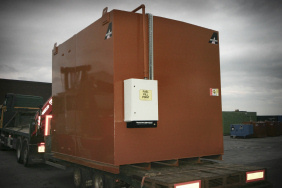 An 825kVA generator and fuel tank are despatched to a hospital in West Yorkshire. 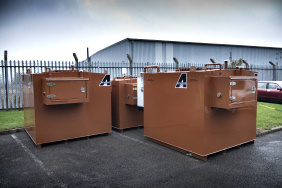 Three more fuel tanks for the Morrisons project are waiting to be loaded and delivered to site. Designed to the Bristish Standards, these fuel tanks are double skinned and can accomodate up to 4,500 litres of fuel. 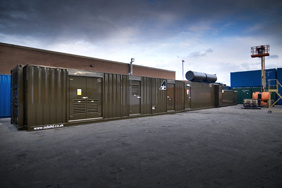 Another 1500kVA generating plant for Morrisons is installed in a weatherproof and silenced container. 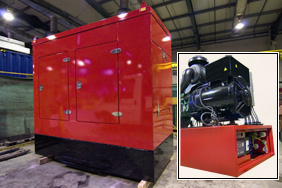 Included in the package is a 3200 AMP changeover panel and a fuel storage and transfer system. The infrastructure to allow for STOR controlled energy export is also built into the system. 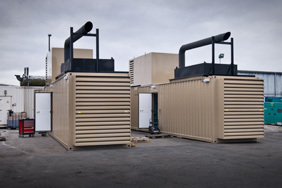 Three of eight Cummins C825 generators housed in 30ft acoustic containers. These generators are destined for a Paris Datacentre. Four 27,000 litre fuel tanks for the Paris Datacentre project. These fuel tanks are designed to meet the British Standard for diesel storage tanks. 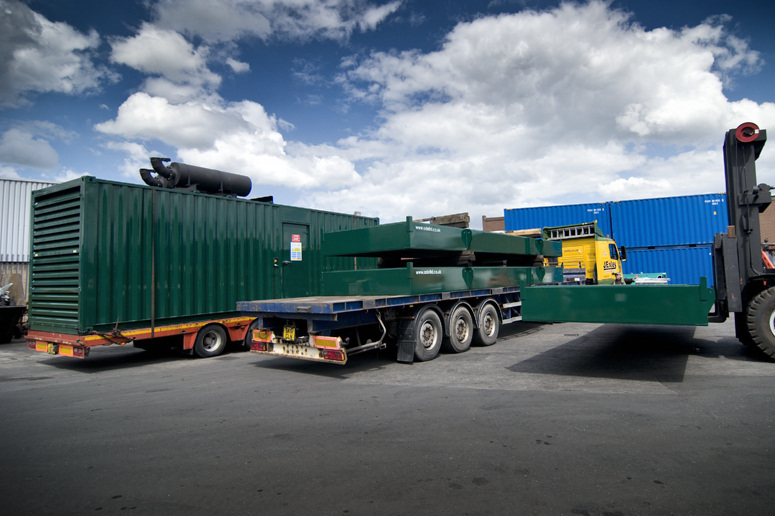 The first of 75 bespoke fuel tanks for a UK wide project is loaded and ready to be delivered to site in London. This 27,000 litre double skin fuel tank is built to the British Standards for diesel fuel storage. 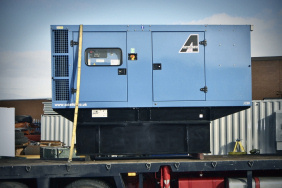 Shown loaded in the yard at ADE is this 330kVA Cummins generator which will be providing standby power for a hospital in Redcar. Also shipped with the generator is a 2000 litre bulk fuel tank. 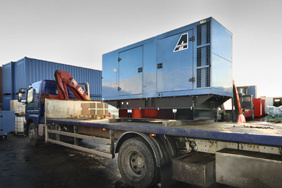 A Perkins 800kVA generator was free issued by a UK generator company to ADE for silencing. 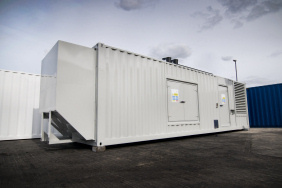 Now housed in a 20ft container and installed on site in Scotland, the generator operates at a noise level of less than 80dB(A) at one metre. 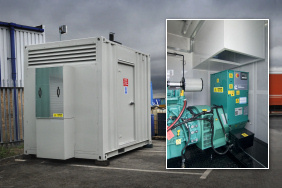 This 220kVA silenced John Deere generator has been fitted with an extended base fuel tank, designed and manufactured by ADE Ltd. Providing standby power for a Police Station in West Yorkshire, this generator is now on site. 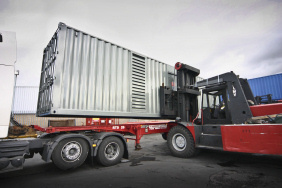 1000kVA generator for a waste management company in Lancashire. 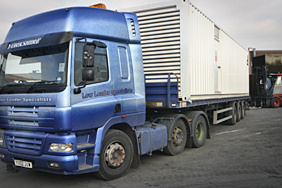 A Cummins C1675 housed in a 40ft ISO container delivered complete with an 8500 litre fuel tank, all pipework and a custom control system. This system is now on site at a UK based Morrisons superstore. 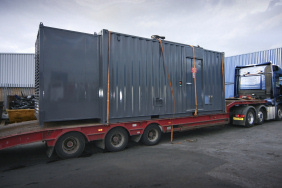 A 1250kVA MTU generator is shown ready to deliver, housed in a 20ft ISO container, complete with extended attenuation. A Cummins C1100D5 housed in an extended 20ft ISO container with a target noise level of 80dBA at 1m. 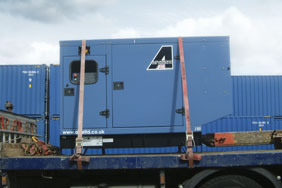 The generator was supplied with a set mounted circuit breaker & first set of filters. 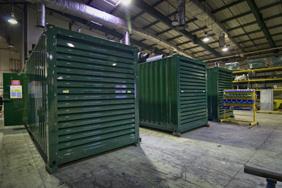 This system is now on site at a UK based waste management company. 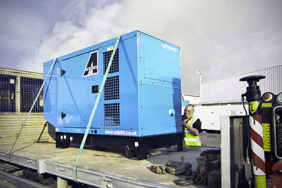 ADE takes delivery of it's first CAT stock item, a 900kVA (stand by) CAT 3412 silenced gen-set. Please contact us for further details. 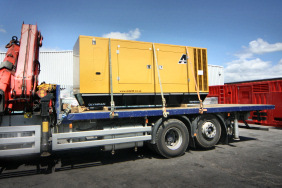 A standard Cummins C55 generator is loaded for transportation to site where it will be installed outside a local municipal swimming pool, providing standby power in case of a mains power failure. 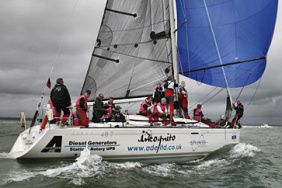 Taking part in this years Little Britain Challenge Cup was very exciting for all involved. We raced in 5 events and finished 9th, 8th, 7th, 10th and for the fifth race we were judged 'On Course Side'. Our average finishing position was 8.5th, which is obviously impossible, therefore I have deducted the .5 and added 7 bonus points for finishing OCS. This means we unofficially came first and won everything. 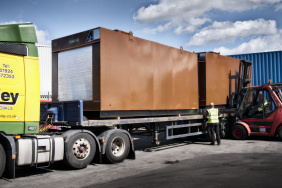 Two of four 20,000 litre fuel tanks to supply the large data centre generator project (see August news below). 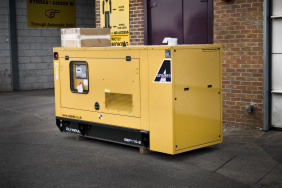 This Cummins QST30 powered generating set is supplied mounted in an ISO type acoustic container. 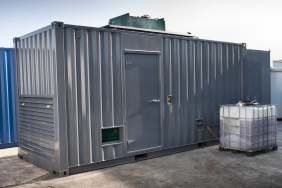 The container is designed to achieve a noise level of 85dBA at 1m at 75% full load and under free field conditions. Assuming a 35°C maximum ambient temperature and 1500RPM operation. ISO style container. 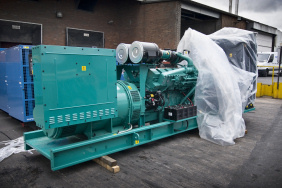 Designed to suit a P500 Perkins 2506A - E15TAG2 powered diesel generating set. 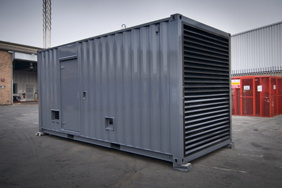 The container is designed to achieve a noise level of 75 dBA at 1m under free field conditions. Assuming a 35°C maximum ambient temperature and 1500RPM operation. 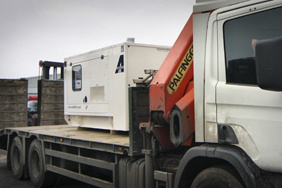 A 38 kVA stand by rated Cummins generator is loaded and shipped to a high street bank in Scotland. A farm in Hampshire has recently undergone restoration to help promote bio-diversity in the area. 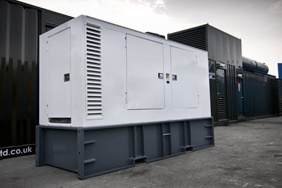 This 165kVA generating set will be providing on site power for various uses, including emergency power in the event of mains failure. Also shipped was a 350AMP changeover panel. Another silenced canopy leaves ADE destined for stand by power operation at a hotel on the M8. The generator is rated at 88kVA (stand by) and is powered by a John Deere engine. 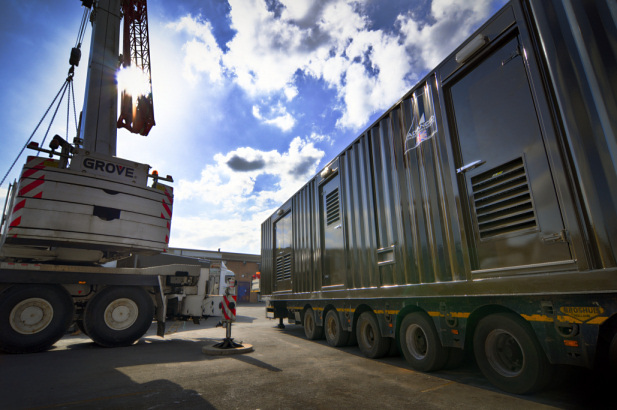 Two generators are synchronised in a load test during stage three of the data centre generators project. 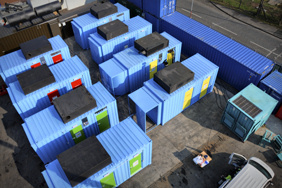 Four of the remaining eight containerised systems are now complete with a further four still in the factory. 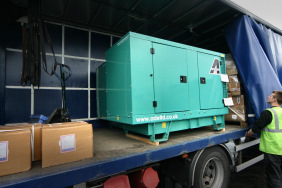 A standard 350kVA canopied generator leaves ADE for a farm in Wensleydale. Also shipped was a custom ATS panel, specified by the customer. Final commissioning of phase two is completed on site this month. Stage three, currently being built back at the ADE factory, is also nearing completion. 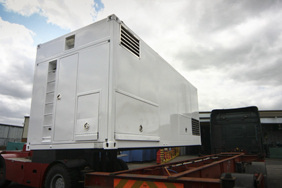 This is a Cummins powered 1675kVA generator, containerised and super silenced. 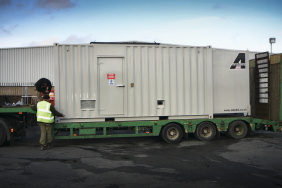 The unit is now on it's way to the customer, a power provider in Ireland. 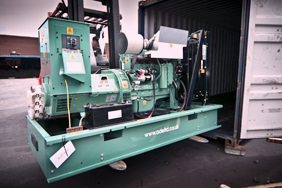 This CAT OLYMPIAN standard canopied generator is PDI'd and ready to leave ADE. 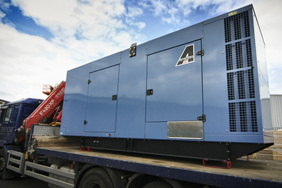 The generator will be delivered to an electrical wholesaler based in Wales. 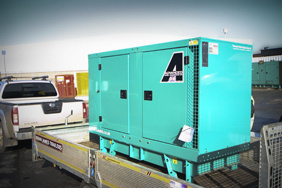 Some like blue, some like green, red, yellow or even pink... No matter what the colour or size, for nearly 20 years ADE Ltd have supplied and maintained thousands of diesel generators. Now, more and more people are turning to ADE for their acoustic solutions, mainly due to the short lead times on our bespoke fabricated enclosures and silencing systems. 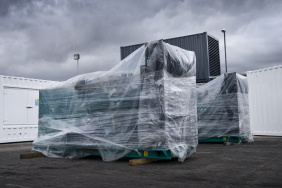 These two Cummins 700kVA generators (shown covered just before a heavy rain storm) are now on their way to their final destinations. 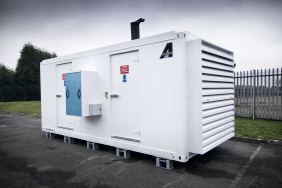 One unit will be providing power for an ice cream factory and the other is destined for a cold stores in the South West, owned by a large agricultural company. Sold to a UK car crushing company to be installed in a plant room on site. End of life cars (and of course those that are not taxed and insured) are made into 1 meter chunks of scrap, at a rate of three per minute! 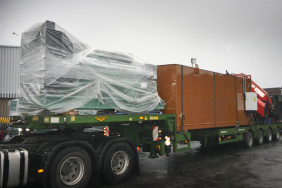 A standard 66kVA John Deere engine departs ADE for a UK based structural waterproofing company. These four silenced, John Deere powered 165kVA generators were sold to a UK based international business-to-business distributor of electrical installation supplies. 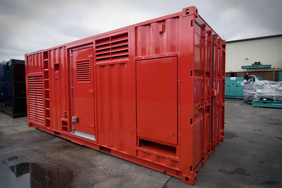 Almost complete and ready to ship this month is another 2500kVA stand by generator in a purpose built drop over canopy. This is a repeat order and the fourth drop over canopy ADE have manufactured for Cable & Wireless. The specification matches that of the units shipped in Feb 2009 and July 2008. 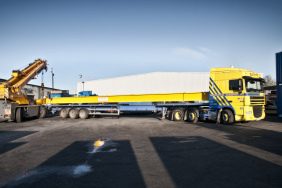 The overall weight of the unit is 30 tonnes! Just one day after these CAT OLYMPIAN generators appeared in our yard and were listed on the website, they were leaving ADE again. With not even enough time to collect a speck of dust, they were shipped out to a Nigerian based generator dealer. 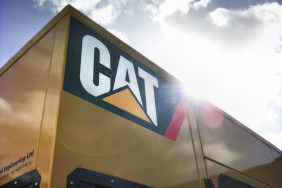 Alongside the 12 CAT generators you can also see a single 18kVA Perkins generator. 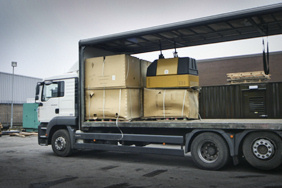 One of two lorries, delivering a total of 18 CAT OLYMPIAN generators to ADE. 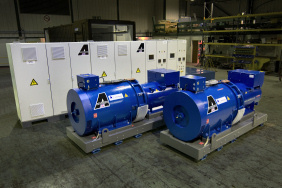 These generators are currently being PDI'd to make them ready for despatch. A bespoke generator system for a hospital in the Midlands. 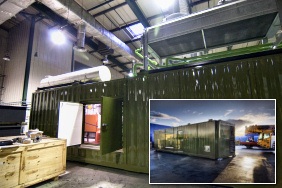 This project included the 500kVA generator in a 20ft container, acoustic attenuation, double skin bulk fuel tank and generator switchgear. 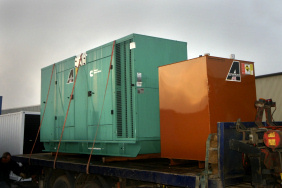 Existing generators on site were also modified to allow set-to-set synchronisation. A Police station in West Yorkshire requested one of our modular John Deere gen-sets but also required a 24 hour bulk fuel supply and a 400Amp ATS panel. These were added by ADE, along with a modified fuel fill point and an externally mounted ATS cabinet. 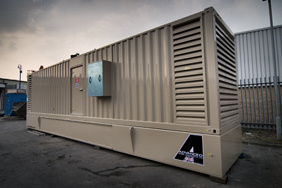 A Cummins 6BTA5.9G water cooled generator is installed in this modified 12 foot ISO container. The 1500 litre fuel tank and silenced inlet/outlet are built into the enclosure, with a cable connection cabinet mounted externally. The various parts shown here are structural sections which make up three shelters. All parts are fabricated from stainless steel, they will be assembled on site and were manufactured for a large UK pump specialist. 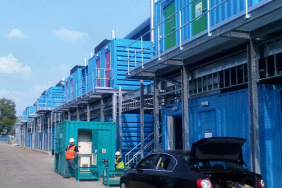 Two containers for a UK data centre. These systems are now on site awaiting commissioning. 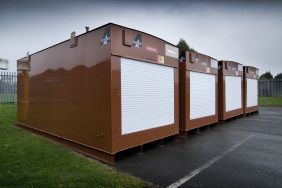 Inside each of these custom modified ISO containers is a 1000kvA diesel generator and an electronically linked rotary UPS unit. Three Cummins generators ship out to Eastern Europe for stand by operation on various dairy farms. 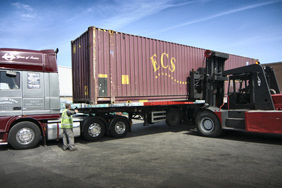 A Cummins C38D5 and a C55D5 are loaded and shipped to Burkina Faso in West Africa. 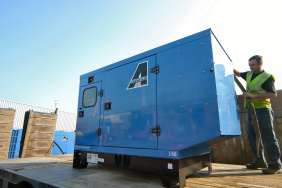 These generators will be providing temporary power for a mining operation. 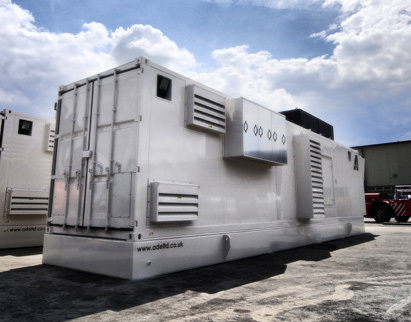 This project included the design, manufacture, delivery and installation of 3 x 1000kVA containerised generators, each with an 8000 litre under-belly fuel tank. 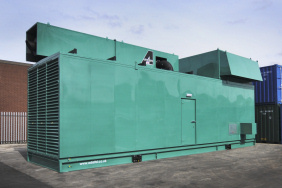 The system will be providing stand by emergency power for a large UK Server Hosting company. 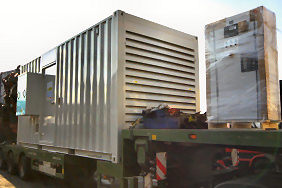 Three Cummins generators with a combined output of over 700kVA are loaded into shipping containers bound for Affrica. 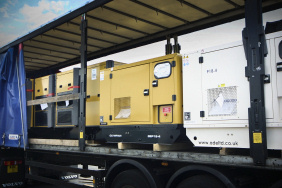 These generators will soon be providing power for an Electricity Services Company. 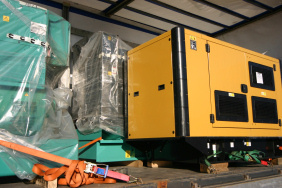 Another 66kVA John Deere generator is despatched from ADE stock. 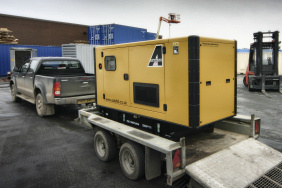 This generator will be providing on-location power for a highway maintenance team. 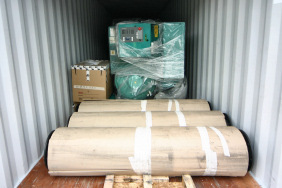 Seven generators are loaded into a container ready for shipment to a client in Russia. 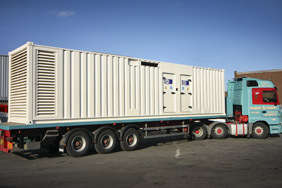 The shipment included three 100kVA Cummins generators, two 300kVA Cummins generators and two 400kVA Volvo powered generators. 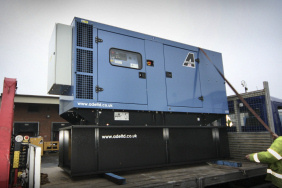 The outside of this well used containerised generator has been refurbished in the ADE factory. Minor internal modifications and cleaning were also completed. The system is now back in the hands of power providers Aggreko. 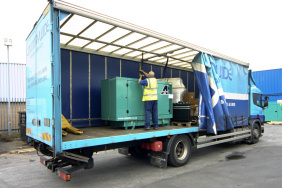 Another John Deere powered generating set is taken from stock at ADE and loaded onto a flat back lorry. 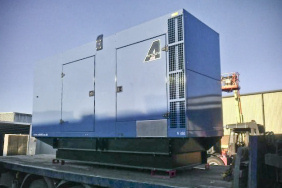 This gen-set is destined for a UK based generator company. 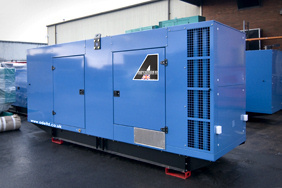 A Perkins generator was free issued to ADE to be installed in one of our 20 foot Power Boxes. Once on site the 800kVA generator will be providing stand by power for a Data Room. 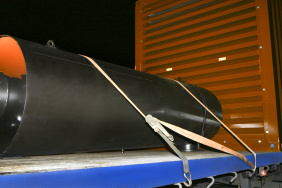 A 1000 litre double skin fuel tank, manufactured by ADE, is loaded onto a trailer for delivery. This tank was manufactured to accept a Pramac GSW30 generator which will be fitted on site. Another John Deere powered, modular 88kVA stand by rated generator is loaded, photographed and made ready to leave ADE for a quarry in Northumberland. A 44kVA John Deere powered generator is loaded onto the customers transport for delivery to site at a waste managment company in the Peak District, Derbyshire. 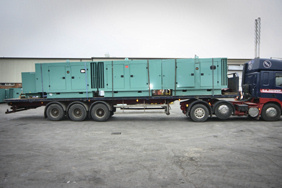 The Jersey Royal Company takes delivery of an 88kVA modular generator. We all love potatoes. 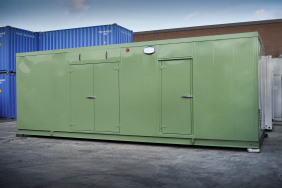 A Super Silent 44kVA generator is sold to esteemed software and electronics, concept and prototyping company dB Tech Ltd. Based on last years prototype, this John Deere powered generator operates at a maximum noise level of 62dB(A) at one metre. 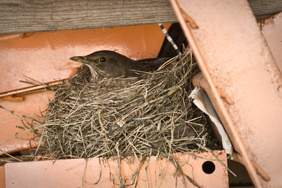 Well we'd like to think that because our generators are so quiet, this Thrush has decided to nest in our yard this year. Every effort is now being made to ensure she is protected until the young have left the nest. We have surrounded the nest with equipment best we can to provide her with some shelter until the summer months. This Mitsubishi generator is loaded and secured onto a flatback lorry, ready to be delivered to site for William G Search, the well respected UK Plant Hire contractor. Another canopy for the entertainments industry is ready to leave ADE. Again, this is the new design with the control panel at the base of the canopy. Whilst things were shuffled about in the workshop, this Power Box briefly came out in the yard and provided a quick photo opportunity. Still requiring certain fittings, the finished system will be providing stand by power in Manchester for a well known bank. 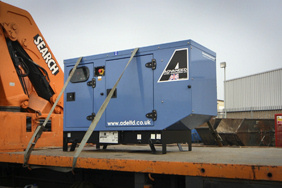 This ruggedised rental generator from Aggreko has just had a makeover at ADE and is now on its way back to the Aggreko depot. 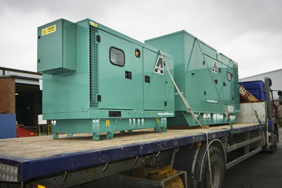 As I write, these generators are now in transit to a Data Centre project in Welwyn Garden City. Designed to operate in parallel, with each pair having colour matched doors to avoid confusion in the event of an emergency. Shipping with an 82 hour fuel tank, this 1250kVA generator will be providing stand by power for a hospital in the West Country. The new design of the classic ADE Showmen's canopy is now more compact and also incorporates the cable connections and fuel tank in a more accessible area adjacent to the fuel tank. With the canopy being designed to fit on a tractor unit, the control panel and cables can now be accessed easily from ground level. 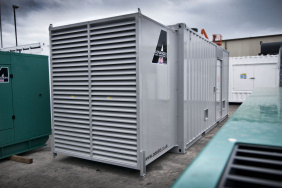 Three times 1000kVA silenced generators are almost ready to leave ADE for a prestigeous UK data server company. 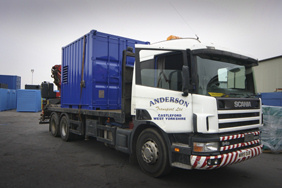 A repaired and re-sprayed 40ft container shown leaving ADE to return to Progress Group. 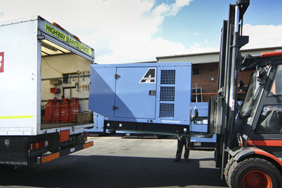 A silenced 200kVA and a silenced 55kVA generator leave ADE destined for a Police force in Lancashire. 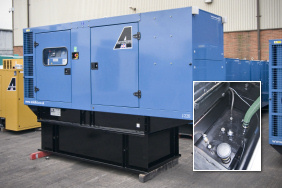 The 55kVA generator was modified with a new cable inlet cabinet due to restrictions with access on site. 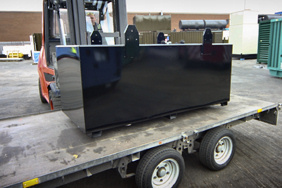 A 10' (3m) ADE Power-Box leaves the factory for a generator company in Stamford. 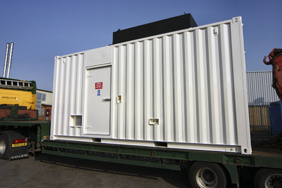 This is a modified ISO container which will have a generator installed once it reaches the customer. 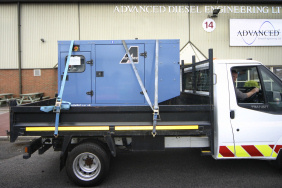 A 100kVA silenced generator, loaded and ready to leave ADE for a generator company based in Worcestershire. More generator canopies from stock at ADE leave the factory destined for a generator company in Chesterfield. 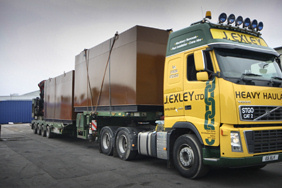 These two 20,000 litre fuel tanks are loaded and delivered to site in Hertfordshire for a Data Centre project. 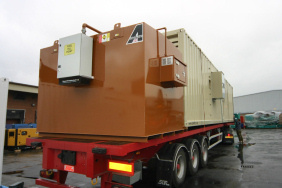 Eight containerised generators will soon follow. 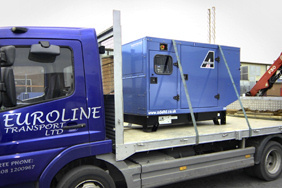 A refurbished 900kVA containerised generator leaves ADE for an Electrical company in Grimsby. 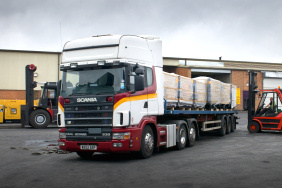 Nine generator canopies are being loaded onto a lorry. These canopies are now the property of a generator company in York. 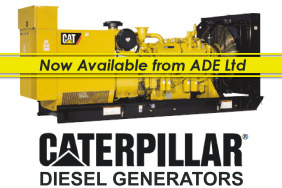 From March 20011 ADE can offer CAT generators. 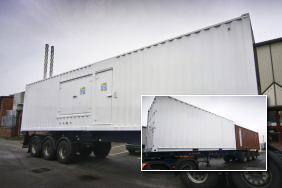 This containerised 20'(6058mm) generator system is silenced to 55dB(A) at one metre. The noise levels had to be massively reduced due to it's location on an office building roof-top in central London, belonging to Scottish Widows. 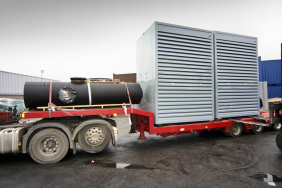 Shown here loaded onto the customers trailer, this silenced generator was supplied to an electrical services company in Sheffield. 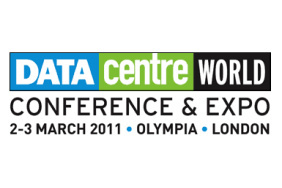 We will be exhibiting at the Data Centre World 2011 Expo this year. The event takes place at the London Olympia on Wednesday the 2nd and Thursday the 3rd of March. 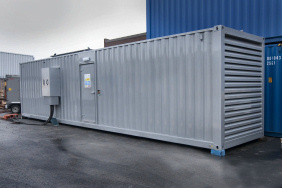 Soon to be providing standby power for a prison in South Yorkshire, this containerised sub station consists of the 1000kVA diesel generator, a seven day fuel tank, 11000V mains power transformer and an array of switchgear. The switchgear consists of the mains to generator changeover panel, power factor correcting system and fused/switched distribution outlets. 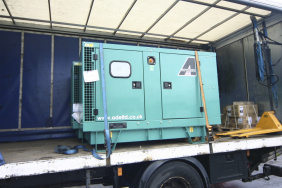 This 200kVA standby generator powered by a John Deere engine leaves ADE for a University in North Wales. 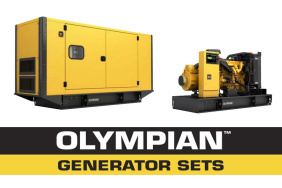 The CAT Olympian range of generators is now available from ADE. 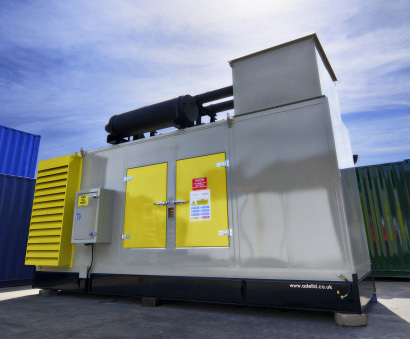 This 550kVA Volvo powered silenced generator, shown at ADE, is now on site providing standby power for a water authority in the East of England. 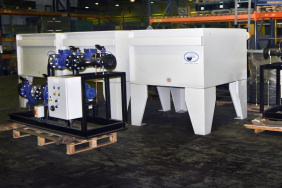 A large bund tray was manufactured and provided with the generator to ensure any spillages are safely contained in the generator area. 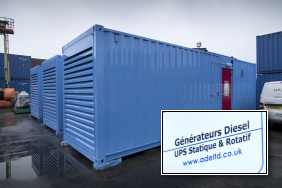 ADE takes delivery of a rotary UPS system for a UK data centre project. 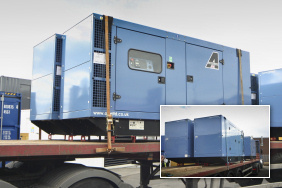 Two more identical 1400kVA containerised generators for the TESCO stores group. 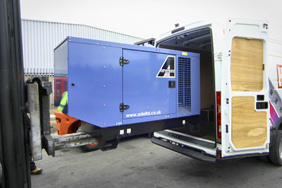 Finishing touches are being applied at ADE's factory to get the generators ready for despatch at the end of the month.